A Peoples’ Self-Help Housing project to provide 33 affordable-housing apartments finally appears to be headed to Cambria. 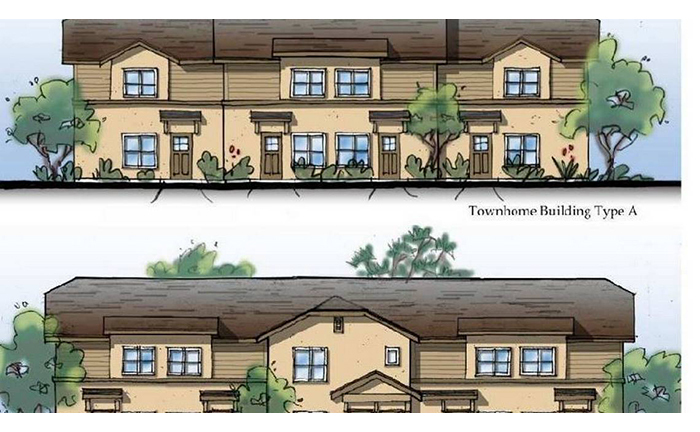 San Luis Obispo County planning commissioners unanimously approved the new Cambria Pines Apartments project Jan. 10 for a gently sloping meadow area near the town’s middle school and a similar Schoolhouse Lane Apartment complex that’s been renting 24 apartments since 1997. The long-planned, reconfigured development now includes 33 units on 2.04 acres of a 5.88-acre parcel, which the county’s project staff report describes as being adjacent to one of the few remaining intact sections of Monterey pine forest on the western edge of East Lodge Hill. The few trees to be removed for the construction would be replaced at the county-approved ratio. There’s no doubt that the need is urgent for affordable housing in pricey Cambria: There’s reportedly a wait list of more than 100 people, some who’ve waited for years for a rare vacancy in the existing units or for the new apartments to be built and available to rent. The new project has been downsized slightly and modified somewhat since it was originally submitted to the county in 2012. By 2013, the plan had expanded to include 40 two- and three-bedroom units on 2.46 acres of a 7.4-acre site. Then, a severe, prolonged drought hit California and the North Coast, and the nonprofit put the project on hold, opting to wait until aquifers had filled and drought declarations and restrictions were lifted. While that drought is officially over, Cambria remains under a 2001 moratorium on new water connections. However, the moratorium includes exceptions for affordable housing. In January 2013, Cambria Community Services District counsel made it clear that the state provides few opportunities to deny service to affordable housing. Limited water supply isn’t one of them, according to attorney Tim Carmel. “The findings are very thin to not approve this kind of proposal,” he said. The new development will encompass eight buildings of apartments, a community services building and some site improvements. The commission approved some modifications to setbacks that would normally be required for four of the seven apartment buildings, and to height restrictions on two others, including the community building. The two-story buildings range from 2,263 to 2,880 square feet, the latter dimension being for the community building with laundry, meeting spaces, kitchen area, restrooms, manager’s unit (second story) and office, counselor office and maintenance storage. The project includes four one-bedroom, 19 two-bedroom and 10 three-bedroom units. Parking would surround the community building, as does a play yard and barbecue area. With an easement and offer to dedicate an adjacent flag lot, the project would extend Schoolhouse Lane by about 290 feet between the site and the middle school. Appeals against the decision can be filed as late as 3 p.m. Friday, Jan. 25. If none are submitted, At that point, the developer can seek financing and low-income tax credits, then start construction, currently expected to begin in 2021.